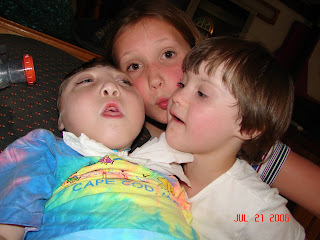 In August of 2006 Ben was unexpectedly sick. This was an unusual time of year for him to become ill. On August 14 I noticed that Ben seemed pretty warm to the touch and so when I took his temperature it was 102. 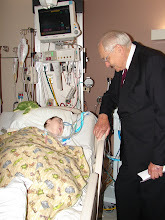 I listened to his lungs at that point and knew right away that he had a pneumonia. We got to the local ER an hour later and his WBC was 25.1 and his chest x-ray was the worst I had ever seen it. 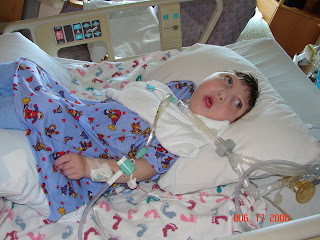 They took him by ambulance to DHMC where he was admitted into the PICU. That stay he grew Pseudomonas and beta-hemolytic group G strep. They put him on the vent and treated him with IV antibiotics. About 5 days into his stay he spiked a 104 fever - not really sure why because after it broke it never came back. He ended up staying 16 days. We got home the day before school started for my kids. I didn't even have all their school supplies that they needed. Less than a month later Ben was sick again. This time he grew out Haemophilus influenza and beta-hemolytic group G strep again. He was treated with IV antibiotics and placed on the vent until he was well enough to go home - 8 days later. Less than a week later we were back. Talk about overwhelming. 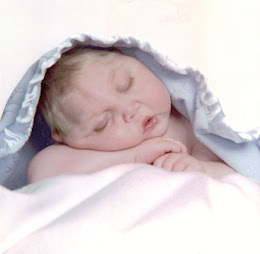 Ben was sick with Pseudomonas, stenotrophomonas and MRSA. He needed the ventilator again and IV antibiotics. This time he reacted to the ceftazidime and so they had to resort to some odd-ball antibiotic to cover his MRSA and Strep. It was a very difficult stay because we had been in for the whole month. I missed most of the first couple of months of my kids school which was really hard for Kayla because she had started the middle school. During this stay we had Ben go through a couple of round of radiation to help control some of his secretions. Unfortuanately, we still haven't really seen an improvement. 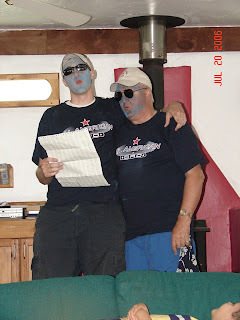 In July of 2006, all of the Hutchins' gathered together for a monstrous family reunion - one that hadn't been done since summer of 2001. We planned this event for two years and when all was said and done I think it went off almost perfectly. We rented a HUGE house in Vermont - over 6,000 feet of living space for all 50 of us. My parents (Becky's), 8 of their children, spouses and 32 grandchildren were present. We spent 7 days in this house and because it was so big we never seemed to feel crowded or bored. It was great. There was plenty enough to do - swimming, pool, ping-pong, tennis, basketball, tv, indoor golf theater, games, biking, walking, etc. It was so nice to just be together and enjoy one anothers company. 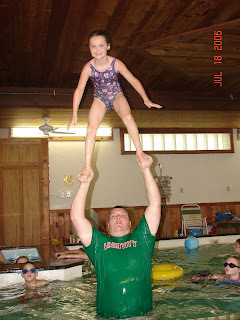 Some of our favorite memories were the morning announcements, family skit night, fruit spaghetti made by Aunt Kelly, Grampy's daily scavenger hunt, Mimi's gift bag and the pool tournament that Roger Jr. almost won - Uncle Steve reigns as champion. Here are some of the pictures from the week. Ben hanging with his newest Cousin Gabe "The Babe" Hutchins. 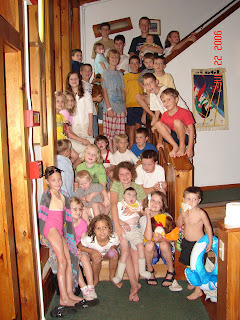 All of the cousins - minus 2 who were being stubborn that day. Hannah, Moriah and Ben pose for a picture. Gabe and Ben - two cool dudes. Morning announcements by the "Blues Brothers". 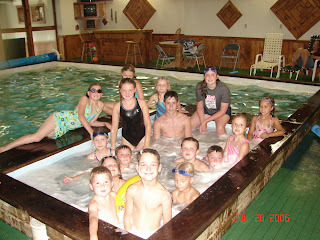 The indoor pool that we swam everyday in. Steve and Stevie showing some SKILLS! 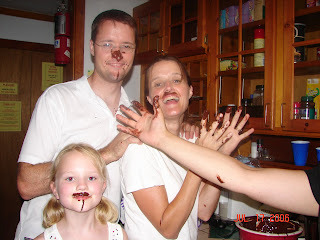 Things got a little messy here and there - Ben, Jenny and Abbey enjoying the chocolate fountain that MiMi brought!!! Another year, another birthday. We spent most of the day Friday at the ER (April 1st) because there were no beds at Dartmouth. Because Ben was stable the plan was to give him IV fluids and antibiotics, send him home and then return the next day for another dose and see where the bed situation was at Dartmouth. I was okay with that and hopeful that just maybe Ben would make his party after all. It took another 4 hours or so to get the IV in (5 attempts) and then to run fluid and the antibiotics. Meanwhile Ben was deteriorating. The ER doc became really concerned and started making calls to other hospitals. Boston Children's was full, Maine Medical was also full. She tried Mass General and they had a PICU bed. The helicopter was sent and Ben and I were flown to Boston. It was a crazy situation. I was really scared to go to a place that didn't know him. The flight team was extra nice and allowed me to go in the helicopter with Ben so that I didn't have to find my way in the city. We arrived at 3am and settled into a crowded, dirty, curtain surrounded bed. The staff was exceptional - the PICU itself was more to be desired. After all the blood work, x-rays, etc. 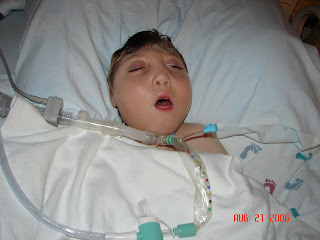 it was determined that Ben had pseudomonas pneumonia (again), strep and MRSA. 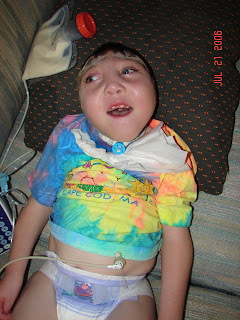 Because of that diagnosis, he was moved into a confinement room that actually had walls. I was much happier to be in a more private area. Poor Ben got worse as the days went by. He was placed on a vent with the highest settings he's ever needed. 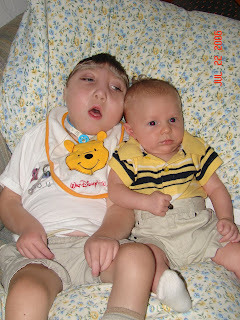 There were a few scary moments when he would be suctioned and it would cause him to brady and stop breathing. They aren't sure why it was happening but thankfully it resolved as he started to get better. It seemed like his IV's blew every day and because he needed IV meds, they had to keep replacing them. At one point they tried to put in a longer lasting PIC line but couldn't get it in. At this point he was on 3 major IV antibiotics which called for daily blood level draws. 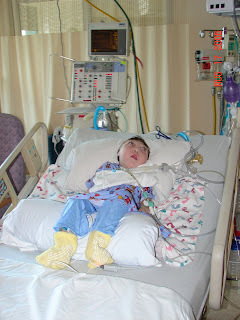 By the 8th day the PICU at Dartmouth finally had a bed and so he was able to be transferred back. He finished 9 more days there before he was discharged home. See all Ben's cards in the background? He is definitely LOVED! For Ben's 4th birthday, Steve and I wanted to do something really special. 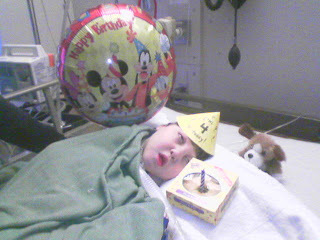 We tried to throw him a big party when he turned 1 but he ended up in the hospital instead, so we wanted to try again. Because of Ben's recent wish trip we decided that we did not want any presents. 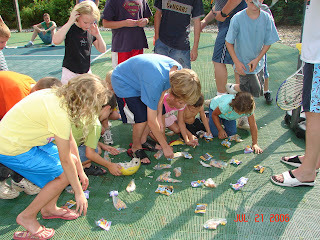 Instead we wanted to purchase a stone at "Give Kids The World" that would be placed in the village. It is a great cause and so we wanted to contribute in any way that we could. We invited over 100 of Ben's closest friends! The day before the big party guess who decides to get sick? You guessed it! Benjamin came down with a high fever, lot's of coughing and green secretions. I had to take him to the local ER to be evaluated. Meanwhile, the party continued on and there were over 100 people that showed. Too bad the guest of honor bagged out AGAIN! We raised almost $1,000 and gave it all to "Give Kids The World". Thank you to everyone who donated, helped out and attended the party! Couldn't have done it without you!!! Happy Birthday my cute boy!